While in Siem Reap, I did a private workshop with Eric d Vries of Photo Cambodia. 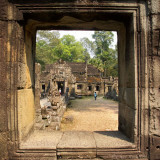 Many of these photos taken at Preah Kahn and Angkor Wat were while I was out with with Eric. It was a fantastic experience and I learned a lot along the way. Banteay Srei Temple, "Citadel of Women"
A wonderful collection of ruins you have gathered. Amazing to see so many people around the temples. I was there in 2003 when everything was much calmer. You took some great photos, wel balanced exposure and great compositions. A superb travel though the Angkor sites. I like your compositions. V.